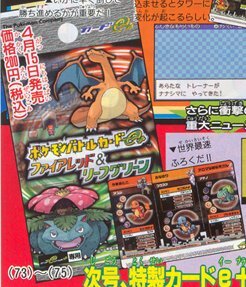 The First Set are 1 on 1 Cards which have 1 or 2 Pokémon to be battled in a 1 on 1 battle. There are 12 of these cards in the set. The Second Set is 2 on 2 Battles where its a 2 on 2 battle where they have no reserves. There are 12 of these cards in the set. The 3rd is the set where it has 3 trainers, 1 after another, each with 1 Pokémon. There are 12 of these cards in the set. The Final type of card reorganizes the way the Trainer Tower is set out. There are 8 of these cards in the set.